COCKRELL, Francis Marion, (brother of Jeremiah Vardaman Cockrell), a Senator from Missouri; born in Warrensburg, Johnson County, Mo., October 1, 1834; attended the common schools; graduated from Chapel Hill College, Lafayette County, Mo., in July 1853; studied law; admitted to the bar in 1855 and practiced in Warrensburg, Mo. 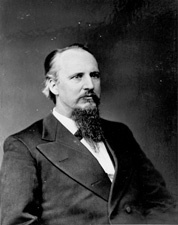 ; served in the Confederate Army as captain, brigade commander, and brigadier general; captured at Fort Blakeley, Ala., in April 1865 and paroled in May 1865; at the close of the Civil War resumed the practice of law; elected as a Democrat to the United States Senate in 1874; reelected four times and served from March 4, 1875, to March 3, 1905; chairman, Committee on Claims (Forty-sixth Congress), Committee on Engrossed Bills (Fifty-first through Fifty-eighth Congresses, except for Fifty-third), Committee on Appropriations (Fifty-third Congress); appointed by President Theodore Roosevelt a member of the Interstate Commerce Commission 1905-1910; appointed in 1911 a United States commissioner to reestablish the boundary line between Texas and New Mexico; civilian member of the board of ordnance in the War Department, which position he held until his death in Washington, D.C., December 13, 1915; interment in Warrensburg Cemetery, Warrensburg, Mo. American National Biography; Dictionary of American Biography ; Cockrell, Francis. The Senator From Missouri, The Life and Times of Francis Marion Cockrell. New York: Exposition Press, 1962; Williamson, Hugh P. Correspondence of Senator Francis Marion Cockrell: December 23, 1885-March 24, 1888. Bulletin of the Missouri Historical Society 28 (July 1969): 296-305.